Fluoride (F-) is a common constituent of many minerals. Municipal water treatment plants commonly add fluoride to the water for various reasons, one of them common belief in prevention of tooth decay. Water fluoridation is controversial, and Fluoride is considered to be a poison in all but one European country. Concentrations above 5 mg/l are detrimental to tooth structure. High concentrations are contained in waste water from the manufacture of glass, steel and aluminum as well as from foundry operations. Organic fluorine is present in vegetables, fruits, nuts, even apples and coffee. Inorganic fluorine, under the name of sodium fluoride, is a waste product of aluminum industry. Because of the current situation, we provide you with a choice of removing it from your drinking water. You can test your water for presence of fluoride with an electronic eXact EZ Water Meter. A typical cartridge-type water filter can be used in Countertop, Under sink, or In-line water filtration systems. Cartridge style systems are designed to work on municipal water that consists of inorganic fluoride. For organic fluoride in well water, use Reverse Osmosis. All countertop systems and most under sink systems below remove other contaminants as well, unless it is specifically says "Fluoride only"! Whole house fluoride removal systems use 52"-54" tall tanks that hold media and that can filter up to 11 gallons per minute. For larger volumes look at Fluoride Removing Commercial Water Filter. Unfortunately, it has been proven that fluoride is not safe. Chronic exposure to fluoride in large amounts interferes with bone formation. 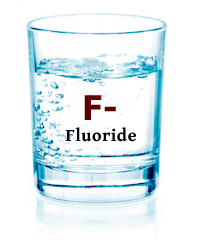 Recently, water fluoridation has even been linked to higher ADHD rates. EPA has established a maximum limit MCL of 4 mg/L (or 4 ppm), and we believe this is is too high to be safe for long term exposure. We have listed all purification systems that are currently available on the market above. They incorporate latest available technology to reduce F- contamination. Our media is NSF-certified and the best that's currently available. Q: Do shower filters remove fluoride? A: No. We are not aware of any shower filter that can work in fast flow and hot water environment, with the filter size being as small as a typical shower filter head.